Inherited by ts::AACDescriptor, ts::AbstractDeliverySystemDescriptor, ts::AbstractMultilingualDescriptor, ts::AC3Descriptor, ts::AC4Descriptor, ts::AdaptationFieldDataDescriptor, ts::AncillaryDataDescriptor, ts::ApplicationDescriptor, ts::ApplicationIconsDescriptor, ts::ApplicationRecordingDescriptor, ts::ApplicationSignallingDescriptor, ts::ApplicationStorageDescriptor, ts::ApplicationUsageDescriptor, ts::AssociationTagDescriptor, ts::AudioPreselectionDescriptor, ts::AudioStreamDescriptor, ts::AVCTimingAndHRDDescriptor, ts::AVCVideoDescriptor, ts::BouquetNameDescriptor, ts::CADescriptor, ts::CAIdentifierDescriptor, ts::CarouselIdentifierDescriptor, ts::CIAncillaryDataDescriptor, ts::ComponentDescriptor, ts::ContentDescriptor, ts::CopyrightDescriptor, ts::CountryAvailabilityDescriptor, ts::CPDescriptor, ts::CPIdentifierDescriptor, ts::CueIdentifierDescriptor, ts::DataBroadcastDescriptor, ts::DataBroadcastIdDescriptor, ts::DataStreamAlignmentDescriptor, ts::DeferredAssociationTagsDescriptor, ts::DIILocationDescriptor, ts::DTSDescriptor, ts::DTSNeuralDescriptor, ts::DVBHTMLApplicationBoundaryDescriptor, ts::DVBHTMLApplicationDescriptor, ts::DVBHTMLApplicationLocationDescriptor, ts::DVBJApplicationDescriptor, ts::DVBJApplicationLocationDescriptor, ts::EacemPreferredNameIdentifierDescriptor, ts::EacemPreferredNameListDescriptor, ts::EacemStreamIdentifierDescriptor, ts::ECMRepetitionRateDescriptor, ts::EnhancedAC3Descriptor, ts::EutelsatChannelNumberDescriptor, ts::ExtendedEventDescriptor, ts::ExternalApplicationAuthorizationDescriptor, ts::ExternalESIdDescriptor, ts::GraphicsConstraintsDescriptor, ts::HDSimulcastLogicalChannelDescriptor, ts::HEVCTimingAndHRDDescriptor, ts::HEVCVideoDescriptor, ts::HierarchyDescriptor, ts::IBPDescriptor, ts::IPMACGenericStreamLocationDescriptor, ts::IPMACPlatformNameDescriptor, ts::IPMACPlatformProviderNameDescriptor, ts::IPMACStreamLocationDescriptor, ts::IPSignallingDescriptor, ts::ISO639LanguageDescriptor, ts::ISPAccessModeDescriptor, ts::LinkageDescriptor, ts::LocalTimeOffsetDescriptor, ts::LogicalChannelNumberDescriptor, ts::MaximumBitrateDescriptor, ts::MessageDescriptor, ts::MPEG4AudioDescriptor, ts::MPEG4VideoDescriptor, ts::MultilingualServiceNameDescriptor, ts::MultiplexBufferUtilizationDescriptor, ts::NetworkNameDescriptor, ts::NPTEndpointDescriptor, ts::NPTReferenceDescriptor, ts::NVODReferenceDescriptor, ts::ParentalRatingDescriptor, ts::PartialTransportStreamDescriptor, ts::PrefetchDescriptor, ts::PrivateDataIndicatorDescriptor, ts::PrivateDataSpecifierDescriptor, ts::ProtectionMessageDescriptor, ts::RegistrationDescriptor, ts::S2SatelliteDeliverySystemDescriptor, ts::ScramblingDescriptor, ts::ServiceAvailabilityDescriptor, ts::ServiceDescriptor, ts::ServiceIdentifierDescriptor, ts::ServiceListDescriptor, ts::ServiceMoveDescriptor, ts::ServiceRelocatedDescriptor, ts::ShortEventDescriptor, ts::SimpleApplicationBoundaryDescriptor, ts::SimpleApplicationLocationDescriptor, ts::SLDescriptor, ts::SmoothingBufferDescriptor, ts::SpliceAvailDescriptor, ts::SpliceDTMFDescriptor, ts::SpliceSegmentationDescriptor, ts::SpliceTimeDescriptor, ts::SSUDataBroadcastIdDescriptor, ts::SSULinkageDescriptor, ts::STDDescriptor, ts::StreamEventDescriptor, ts::StreamIdentifierDescriptor, ts::StreamModeDescriptor, ts::StuffingDescriptor, ts::SubtitlingDescriptor, ts::SupplementaryAudioDescriptor, ts::SystemClockDescriptor, ts::T2MIDescriptor, ts::TargetBackgroundGridDescriptor, ts::TargetIPAddressDescriptor, ts::TargetIPSlashDescriptor, ts::TargetIPSourceSlashDescriptor, ts::TargetIPv6AddressDescriptor, ts::TargetIPv6SlashDescriptor, ts::TargetIPv6SourceSlashDescriptor, ts::TargetMACAddressDescriptor, ts::TargetMACAddressRangeDescriptor, ts::TargetSerialNumberDescriptor, ts::TargetSmartcardDescriptor, ts::TeletextDescriptor, ts::TimeShiftedEventDescriptor, ts::TimeShiftedServiceDescriptor, ts::TimeSliceFECIdentifierDescriptor, ts::TransportProtocolDescriptor, ts::TransportStreamDescriptor, ts::VBIDataDescriptor, ts::VideoStreamDescriptor, and ts::VideoWindowDescriptor. The descriptor tag can be modified by subclasses only. Abstract base class for MPEG PSI/SI descriptors. [in] xml_name Descriptor name, as used in XML structures. [in] pds Required private data specifier if this is a private descriptor. Get the required private data specifier. The private data specifier which is required to interpret correctly this descriptor in a section. Return zero if this descriptor is a DVB-defined or MPEG-defined descriptor, not a private specifier. Check if this descriptor is a private descriptor. True if this descriptor is a private descriptor, false if it is a DVB-defined or MPEG-defined descriptor. This abstract method serializes a descriptor. [out] bin A binary descriptor object. Its content is replaced with a binary representation of this object. Implemented in ts::LinkageDescriptor, ts::TeletextDescriptor, ts::SSULinkageDescriptor, ts::TransportProtocolDescriptor, ts::SSUDataBroadcastIdDescriptor, ts::VBIDataDescriptor, ts::CADescriptor, ts::NPTReferenceDescriptor, ts::LogicalChannelNumberDescriptor, ts::HDSimulcastLogicalChannelDescriptor, ts::EutelsatChannelNumberDescriptor, ts::ISO639LanguageDescriptor, ts::ParentalRatingDescriptor, ts::ServiceListDescriptor, ts::SubtitlingDescriptor, ts::ExternalApplicationAuthorizationDescriptor, ts::SpliceSegmentationDescriptor, ts::DIILocationDescriptor, ts::ApplicationRecordingDescriptor, ts::ApplicationSignallingDescriptor, ts::ExtendedEventDescriptor, ts::TargetIPSourceSlashDescriptor, ts::TargetIPv6SourceSlashDescriptor, ts::PrefetchDescriptor, ts::AudioPreselectionDescriptor, ts::NVODReferenceDescriptor, ts::LocalTimeOffsetDescriptor, ts::TargetIPSlashDescriptor, ts::TargetIPv6SlashDescriptor, ts::TargetMACAddressRangeDescriptor, ts::ApplicationDescriptor, ts::MultilingualServiceNameDescriptor, ts::ShortEventDescriptor, ts::EacemPreferredNameListDescriptor, ts::HEVCVideoDescriptor, ts::EnhancedAC3Descriptor, ts::DataBroadcastIdDescriptor, ts::ContentDescriptor, ts::CountryAvailabilityDescriptor, ts::TargetIPAddressDescriptor, ts::TargetIPv6AddressDescriptor, ts::SpliceDTMFDescriptor, ts::TargetMACAddressDescriptor, ts::AbstractMultilingualDescriptor, ts::AC3Descriptor, ts::AVCTimingAndHRDDescriptor, ts::AVCVideoDescriptor, ts::TerrestrialDeliverySystemDescriptor, ts::MessageDescriptor, ts::ApplicationStorageDescriptor, ts::IPMACGenericStreamLocationDescriptor, ts::IPMACStreamLocationDescriptor, ts::SatelliteDeliverySystemDescriptor, ts::SpliceTimeDescriptor, ts::TargetSmartcardDescriptor, ts::CAIdentifierDescriptor, ts::CueIdentifierDescriptor, ts::DTSDescriptor, ts::GraphicsConstraintsDescriptor, ts::HEVCTimingAndHRDDescriptor, ts::HierarchyDescriptor, ts::IPMACPlatformNameDescriptor, ts::IPMACPlatformProviderNameDescriptor, ts::TargetSerialNumberDescriptor, ts::VideoStreamDescriptor, ts::ApplicationIconsDescriptor, ts::ComponentDescriptor, ts::DVBJApplicationLocationDescriptor, ts::ISPAccessModeDescriptor, ts::MaximumBitrateDescriptor, ts::PartialTransportStreamDescriptor, ts::ServiceAvailabilityDescriptor, ts::ServiceDescriptor, ts::TimeSliceFECIdentifierDescriptor, ts::ApplicationUsageDescriptor, ts::DVBHTMLApplicationBoundaryDescriptor, ts::DVBHTMLApplicationDescriptor, ts::DVBHTMLApplicationLocationDescriptor, ts::IPSignallingDescriptor, ts::S2SatelliteDeliverySystemDescriptor, ts::SpliceAvailDescriptor, ts::StreamEventDescriptor, ts::AACDescriptor, ts::AC4Descriptor, ts::CableDeliverySystemDescriptor, ts::CPDescriptor, ts::DataBroadcastDescriptor, ts::DVBJApplicationDescriptor, ts::EacemPreferredNameIdentifierDescriptor, ts::EacemStreamIdentifierDescriptor, ts::NPTEndpointDescriptor, ts::SimpleApplicationBoundaryDescriptor, ts::SimpleApplicationLocationDescriptor, ts::SupplementaryAudioDescriptor, ts::AssociationTagDescriptor, ts::AudioStreamDescriptor, ts::DeferredAssociationTagsDescriptor, ts::RegistrationDescriptor, ts::ServiceIdentifierDescriptor, ts::T2MIDescriptor, ts::BouquetNameDescriptor, ts::ECMRepetitionRateDescriptor, ts::IBPDescriptor, ts::MultiplexBufferUtilizationDescriptor, ts::NetworkNameDescriptor, ts::ServiceMoveDescriptor, ts::ServiceRelocatedDescriptor, ts::StreamModeDescriptor, ts::SystemClockDescriptor, ts::TargetBackgroundGridDescriptor, ts::TransportStreamDescriptor, ts::VideoWindowDescriptor, ts::AdaptationFieldDataDescriptor, ts::AncillaryDataDescriptor, ts::CarouselIdentifierDescriptor, ts::CopyrightDescriptor, ts::DTSNeuralDescriptor, ts::PrivateDataIndicatorDescriptor, ts::PrivateDataSpecifierDescriptor, ts::ProtectionMessageDescriptor, ts::ScramblingDescriptor, ts::SmoothingBufferDescriptor, ts::STDDescriptor, ts::StreamIdentifierDescriptor, ts::StuffingDescriptor, ts::TimeShiftedEventDescriptor, ts::CIAncillaryDataDescriptor, ts::CPIdentifierDescriptor, ts::DataStreamAlignmentDescriptor, ts::ExternalESIdDescriptor, ts::MPEG4AudioDescriptor, ts::MPEG4VideoDescriptor, ts::SLDescriptor, and ts::TimeShiftedServiceDescriptor. 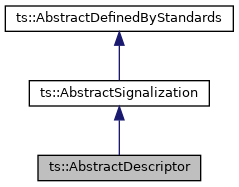 This abstract method deserializes a binary descriptor. [in] bin A binary descriptor to interpret according to the descriptor subclass. Deserialize a descriptor from a descriptor list. In case of success, this object is replaced with the interpreted content of the binary descriptor. In case of error, this object is invalidated. [in] dlist A list of binary descriptors. [in] index Index of the descriptor to deserialize in dlist. Tool for serialization: get a byte buffer for serialization. A safe pointer to a two-byte byffer containing the descriptor tag and zero as length. Tool for serialization: complete a serialization. [out] bin A binary descriptor object which receives the serialized object. [in] bbp Safe pointer containing the serialized data, typically returned by serializeStart(). The tag and length will be updated. True if the serialized descriptor is valid.